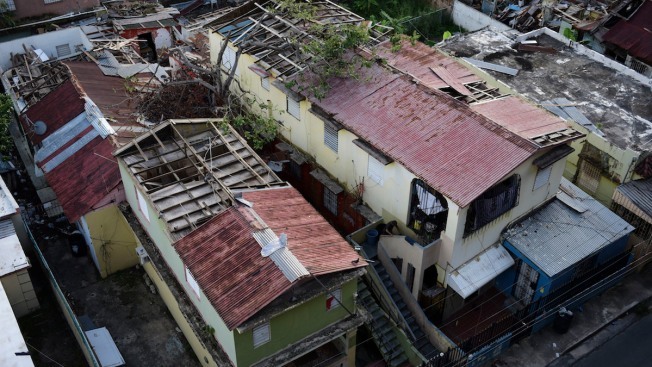 In this Nov. 15, 2017 photo, some roofs damaged by the whip of Hurricane Maria are still exposed to rainy weather conditions, in San Juan, Puerto Rico. A newly created Florida company with an unproven record won more than $30 million in contracts from the Federal Emergency Management Agency to provide emergency tarps and plastic sheeting for repairs to hurricane victims in Puerto Rico. Bronze Star LLC never delivered those urgently needed supplies, which even months later remain in demand on the island. After Hurricane Maria damaged tens of thousands of homes in Puerto Rico, a newly created Florida company with an unproven record won more than $30 million in contracts from the Federal Emergency Management Agency to provide emergency tarps and plastic sheeting for repairs. Thousands of Puerto Ricans remain homeless, and many complain that the federal government is taking too long to install tarps. The U.S. territory has been hit by severe rainstorms in recent weeks that have caused widespread flooding. One of the brothers, Kayon Jones, said manufacturers he contacted before bidding on the contracts assured him they could provide the tarps but later said they could not meet the government's requirements. Jones said supplying the materials was problematic because most of the raw materials came out of Houston, which was hit hard by Hurricane Harvey. He said he sought a waiver from FEMA to allow him to order tarps from a Chinese manufacturer and for more time, but FEMA denied the request. "We were trying to help; it wasn't about making money or anything like that," Jones said. "The award of a government contract to a company with absolutely no experience in producing the materials sought obviously raises very bright red flags," said Dan Feldman, professor of public management at the John Jay College of Criminal Justice at City University of New York. "I would hope and assume that the inspector general for the Department of Homeland Security would begin immediately to take a very hard look at this process." A FEMA spokesman, Ron Roth, said the agency's review process was "somewhat expedited" after Hurricane Maria to respond as quickly as possible to the emergency. But he said the agency did perform its due diligence. "Submissions from potential contractors are objectively evaluated, and a contract is awarded based on the highest-rated submission," Roth said. Such "best value" competitive solicitations take into account past performance and a contractor's ability to deliver as well as price, said Alan Miller, an attorney who spent 22-years advising federal contracting officials until retiring last year. "In every circumstance, regardless of the award, whether it's $400 to the local stationery company for envelopes, or it's $400 million for a construction contract, the contracting officer is required to make a responsibility determination," Miller said. "Does this company have the infrastructure; do they have the inventory processes, the production processes, the financial capability, for performing the work?" "FEMA's initial technical evaluation determined Bronze Star could do the jobs based on their proposals, which confirmed that they could meet the product specifications and delivery dates," he said. In an interview, Jones told The Associated Press he picked the name because he has another company with the word star in it. He said his brother, who is also listed on state incorporation documents for the business, served in the Army and is disabled. Army records show Jones' brother also didn't receive a Bronze Star, and it provided no evidence of a service-related injury. Richard Jones did not respond to multiple calls and requests through his brother for comment. "My brother and I, we are both veterans, so we just came up with a name to do business," Kayon Jones said. "We're not saying we have a Bronze Star or anything." More than 93,000 tarps have been sent to distribution centers on the island and now are available to cover homes, Roth said. The Army Corps of Engineers' "Blue Roof" program has provided 11,000 more reinforced tarps installed on homes by contractors. Michael Byrne, Puerto Rico's FEMA coordination officer, estimated that at least 60,000 blue roofs are needed across the island. About 350 are installed each day, though he said that is expected to increase. "One of the limiting factors is the availability of the material," Byrne said. 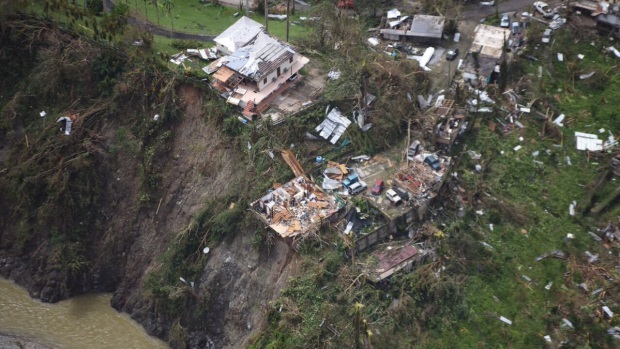 AP writer Danica Coto in San Juan, Puerto Rico, contributed to this report.